then you'll love this year's Tour de France. The two differences are that cyclists never face flames and that they have nothing to absorb or deflect the full impact of their falls other than the thin film of lycra that covers their torsos. American GC contender Christian Vande Velde (photo above) of Garmin Slipstream was able to finish Monday's Stage but was unable to continue riding Wednesday after Xrays revealed he'd suffered several broken ribs. 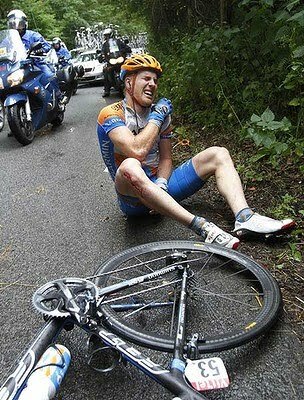 His U.S. teammate, Tyler Farrar, the best American sprinter in the race (photo below) was not so lucky. His broken bones in the same accident were obvious, but he still finished the stage resting his left arm on his handle bars before being taken to the hospital. The first three days of racing have taken out several of the most notable participants in this year's race and the primary assistants of several others. Yesterday's Stage Two saw almost half of the riders in the race hit the deck after a motorcycle crash spilled across and already-wet, descending side of a steep hill. 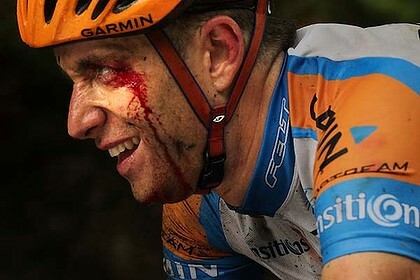 I do not find the crashes nearly as exciting as the actual racing. The threat of carnage like what we witnessed the past three days always is just around the corner any at time 190 of the best bicycle riders in the world start racing against one another, and the fact that most of the riders avoid these accident's 99.99% of the time they are on the road makes the racing even more exciting to me. Today's Stage Three produced lots of excitement across the cobble stone roads of Belgium and France. You probably can see hi lites of yesterday's action and all of today's exciting race on The Versus Channel tonight.